The USA is experiencing a significant shift to the "right" in terms of its views of immigration into the country. Because of the USA government's changing view of visa provisions, there is a higher than usual possibility that the information on this page has changed. Please check with your closest USA embassy. So you need to get past Donald Trump's border security, and into the United States, and you face the daunting task of getting a USA visa. The good news is, that if you're not a Mexican criminal then there's a chance you could be blessed with a visa. And yes, in case you're wondering, South Africans do require a visa to visit the USA. And no, you won't be asked whether your support Trump. This article assumes you are a South African citizen without dual US citizenship or the right to live in the USA; and that you are wanting a Tourist Visa to the United States. In the lingo of the US Government, Tourist Visas are a subset of of the "Nonimmigrant Visas". 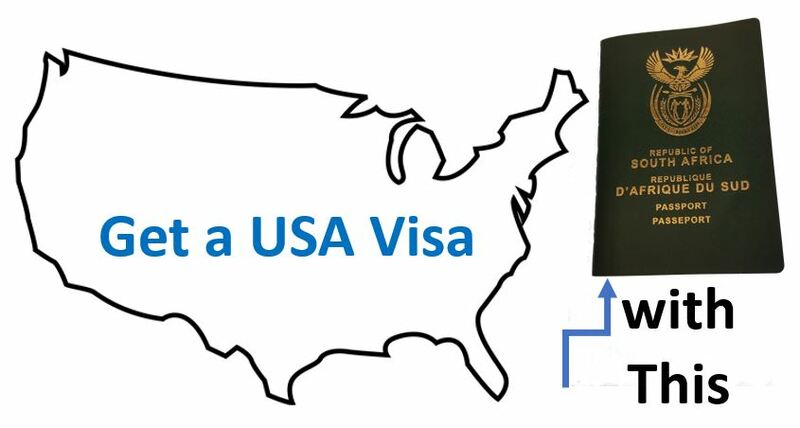 Click here to navigate to the official application area for a USA visa. The information on this page should be considered to be possibly out of date or incorrect, and in some cases is summary information, so double-check everything on the official application page. This webpage attempt to provide you with guidance on applying. The USA has consulates in Cape Town (consularcapetown@state.gov), Durban (consulardurban@state.gov) and Johannesburg (consularjohannesburg@state.gov); who will consider and process your tourist visa request. Note that the US Embassy in Pretoria does not offer consulate services. A South African passport with at least 6 months of validity after the date of your travels to the USA. Not everybody supports Trump - in fact, the majority don't. Don't tease those with a southern accent. They don't use the metric system. You can purchase chlorinated chicken and beef on antibiotics. The cars are huge and mostly automatic. They wont respect you if you bow to their superiority complex. Get used to the archaic Fahrenheit system, insted of Celsius. Fahrenheit is only used by the US, Cayman Islands, Liberia and the Bahamas. See the native wild turkeys. If you do something wrong, you may end up in one of the dreaded "for-profit" prisons. Click here to complete "the Online Nonimmigrant Visa Application" form, coded "DS-160" (don't worry about the complex name). .
First you select the country and city in which you are applying (as opposed to the country for which you have a passport). South Africa has 3 options: Johannesburg, Cape Town or Durban. Then click on the relevant application button. You will then be given an "Application ID", which consists of a combination of letters and numbers. If you do not finish your application in one go, you can use the application ID to return where you left off the previous time. You will be asked to select a security question, e.g. "What is the given name of your father's father"? The term "given name" is the same as what's commonly called a "first name" in South Africa. Then click "Continue". You'll then need to enter your Given Names and Full Name. Naturally, this must be exactly the same as in your passport, or else you'll run into problems later. Enter your gender, marital status, date of birth and place of birth. Then click on "Next: Personal 2". Enter your nationality (e.g. South African), whether you've held citizenship with another country, whether you're a permanent resident of another country, your ID number, US Social Security Number (if you have one) and US Taxpayer ID Number (if you have one). Then click on "Next: Address and Phone". Then fill in your physical address, postal address, telephone numbers and email address. Then click "Next: Passport". Select your passport type and enter your passport number, where it was issued, the date it was issued and the date on which it expires. Then click "Next: Travel". If you're going to the US for a non-business related holiday (tourism/travel) then select "TEMP. BUSINESS PLEASURE VISITOR (B)" and then "TOURISM/MEDICAL TREATMENT (B2)". Fill in your planned date of arrival into the US, how long you are planning to stay, and who is financing the trip. For your address in the USA, place the physical address of the hostel, hotel or guest house, at which you will be spending your first night. Expect to be quizzed again at immigration as to where you're staying and for how long. Then click "Next: Travel Companions". Fill in the details of who you are travelling with, then click "Next: Previous US Travel". Then fill in details of previous trips to the USA, as well as previous visa applications. It's advantageous if you've previously travelled to the US, and didn't infringe on any of the country's laws, as it demonstrates a good track record. Then specify the person who is your contact person in the US, and his/her contact address. Then detail your mother and father's names and dates of birth, as well as whether you have any other relatives in the USA. Fill in your occupation, employer and monthly income. Fill in whether you were previously employed, whether you attended a secondary educational institution, and its details. Details of any tribe you may belong to, languages you speak, countries you've been to in the last 5 years, charitable/social/professional organisations you've belonged to, whether you have skills in chemicals/biologicial/explosives/guns/nuclear, whether you've ever served in the military and whether you've ever participated in a guerilla group, paramilitary unit, insurgent group, rebel group or vigilante unit. Input whether you have any communicable disease, or a drug addict/abuser or have a mental/physical disorder which makes you a danger to others or yourself. Have you ever been arrested, been involved in criminal activity around controlled substances, is your visit prostitution related, have you been involved or plan to be involved in in money laundering, been involved in child trafficking; or related to somebody who has been? Are you a member of a terrorist organisation? Have you "ever sought to obtain or assist others to obtain a visa" into the US by illegal means? withheld custody of a child who is a US citizen "from a person granted legal custody by a US court"
Renounced USA citizenship to avoid tax. Then upload your photo - you may not wear eye glasses in the photo. The required specifications of the photo can be found here. Be sure to carefully check the requirements, as with advances in facial recognition software, this has become more important than before. Then you get a chance to check your info, then sign and submit iT. Unfortunately you're going to have to appear in person for an interrogation interview, unless you qualify for visa renewal. The consulates are heavily secured compounds (you have got to play it safe when you're the world's police officer) in Cape Town, Durban and Johannesburg - pick the one closest to you; and don't expect to be able park closeby. Click here to register a profile with the U.S. Department of State Visa Appointment and Information system. You'll register it with your email address and (optionally) your smartphone number. You will need to fill in your DS-160 number, to connect step 1 with step 2; as well as the DS-160 confirmation for every other person travelling with you. Pay the Nonimmigrant Visa application fee - this is non-refundable. Keep the paymet receipt to take with you to your interview. Schedule a Consular Section appointment" and attend said appointment with your printed out DS-160 and all the other documentation required. During peak times you may wait up to a month, roughly, to schedule an appointment, but it's usually much shorter. Then follow the instructions given to you at the consulate, checking regularly on the website to see updates. To prove employment you can obtain a letter from your employer on a company letterhead, stating that you are empoyed there, what you earn, your position, and the dates of leave. If you're self-employed then get a similar letter from your accountant. return plane ticket (if you've booked already). Also present evidence that there are sufficient finances at your disposal that you'll be able to get through the holiday. Be clear about how long you're going and the purpose of your visit. Also take along your passport, previous passports, payment receipt, printed D-160 form, a paper copy of your appointment confirmation and any other documents mentioned on their website or emails. Having said that, you may arrive for the interview with a box full of evidence, and not be asked to produce some of it. If you've been arrested before then provide all information related to the case, and your police clearance certificate. On getting to the consulate, you'll need to clear a security checkpoint, and will be asked to leave all your electronic equipment in a tiny locker - e.g. your cellphone and car keys. Leave your firearms with you. Bottled drinks can be problematic. It's also at this point that they'll have a first look at whether you brought along all your required documents - e.g. a printed DS-160 form. Only ask questions posed to you - don't volunteer information not asked of you. You'll be asked questions including why you're visiting the USA, and perhaps to produce the required documentation. A few days later you'll be told whether or not your application was approved, and that you can go and pick up your passport or have it delivered. Whilst it is a mission getting the visa, what's great is that they often make it valid for 10 years, unlike for instance a Schengen visa which is only valid for the period of your visit. And you can also stay for longer - up to 6 months (and can apply for an extension). The Cape Town consulate is at number 2 Reddam Avenu, Steenberg e in Westlake. Their email address is americanscapetown@state.gov and their landline is 021-702-7300. We suggest parking at Steenberg Village shopping centre and walking to the consulate. The Durban consulate is situated at 303 Dr. Pixley KaSeme Str, 31st Floor, Delta Towers in Durban Central (next to Thunderpeak Spur). You can get hold of them at consulardurban@state.gov or 031-305-7600. The Johannesburg consultate is situated at 1 Sandton Dr, Sandhurst in Sandton (look for the US flag flying on its post). You can contact them at consularjohannesburg@state.gov or 011-290-3000. Although there are some horror stories of people being refused visas, the statistics for 2016 indicate that only 7% of South Africans who applied for B visas, were refused. This is a better performance than Australia (15%) and far better than Cuba, which has the highest refusal rate of 82%. Commonly called "DV" or "DV lottery", this is the program which Donald Trump wants to stop. It involves a computer randomly choosing 50,000 people a year from applicants with certain countries which don't have high emigration levels into the USA, and giving them permanent residence in the United States. Act 203(c) of the Immigration and Nationality Act sets out the process. You need to have worked for 2 years or have passed high school. South Africa is eligible for the DV-2019 lottery. A J-1 visa; for research scholars. exchange visitors and professors. A M-1 visa; if you want to attend a vocational or technical course, or some other non-academic institution (but excluding language courses). A F-1 visa; if you want to attend a college, university, elementary school, high school, conservatory, seminary, other academic institution or language training course. You'll need to apply for and be accepted into your course before you can apply for a student visa; which is proven by obtaining a document coded I-20 from the university or other educational institution which is admitting you. The institution must be authorised to admit foreign students under the Student and Exchange Visitor Information System (SEVP), which is used to track foreign students, and was set up after the 9/11 terrorist attacks. Click here to see the list of authorised academic institutions for M-1 and F-1 students. Note that undergraduate courses in the USA are usually 4 years, one more year than the typical degree in South Africa. It rarely happens, but in December 2017 the ACCT (American College of Commerce & Technology) was found not to be qualified to be a university, and was given notice to close down on the 30th Dec 2017. Students at the university with F-1 visas were given 60 days within which they had to be accepted at another licensed institution. Be careful to avoid the "visa mills", institutions which are more focused on earning tuition fees than in offering a quality education. Most foreign students come from China followed by India, Saudi Arabia, South Korea and Canada. Those on an M1 visa may not work until they have finished their their studies. May do on-campus work, with restrictions. After the first year of studies, they may do certain types of practical training related to their course. apply to work for a year in the USA, putting into practice what you have learnt (Optional Practical Training - OPT). The student would work with a "designated school official" who will be in contact with the US Citizenship & Immigration Service to obtain an "employment authorisation document". And there's a nice tax benefit for US companies employing OPT students, in that they don't have to pay Medicare and Social Security on their wages (on the other hand, if the company had to employ American graduates, they would not enjoy the tax break). if after that you'd still like to work more in the USA, it's a lot harder than getting permission for OPT; you'd need to apply for an H1-B visa with all its requirements. Companies in the US are allowed to hire foreign workers under an H1-B visa, if they cannot find an American to do the job; and the visa holder is then only allowed to work for that company. The visa is typically issued for 3 to 6 years. Rules are getting stricter, with the Department of Homeland Security planning by February 2018 to reduce the eligible occupations "to increase focus on truly obtaining the best and brightest foreign nationals". There are 85 000 H1-B visas which could be issued in 2018, but many more applications are usually filed than the spots available. Priority will be given to those earning more and those who are more skilled. Reports are that applications for H1-B visas for those who won the lottery are being delayed as well as for those who are requesting an extension to their existing H1-B visa; and an increasing number of "requests for evidence" are being sent. Under a request for evidence companies need to show documents proving that the applicant has special skills, and that the salary being paid to the visa-holder is fair. The denial rate for H1-B petitions has similarly increased. The administrative burden of the requests for evidence is likely to deter some companies from hiring foreigners. According to the American Competitiveness in the Twenty-first Century Act of 2000, an extension of 1 year or 3 years may be offered to H1-B visa holders. The denials and requests for information appear to revolve around (a) if a Level 1 wage is being paid, does the job really meet the criteria for a 'specialty position', and (b) Is a bachelors degree really required to do the job. The children and spouse of an H1-B visa holder may enter the US under an H-4 visa as long as the H1-B visa holder still holds the visa. In December 2017 rules were reported to be changing so that H-4 EADs would no longer be issued. Of course, there's nothing stopping holders of H-4 visas from pursuing other methods of getting work visas, such as getting their own H1-B visa, if they qualify; or if they have an extraordinary ability in a field they could even apply for an O-1A or an O-1B Visa. Once children holding H-4 visas turn 21, they must return to their home country if they have not obtained permanent residency or a different visa allowing them to stay in the USA (e.g. an H-1B visa or a student visa), proof that spouse/parent has applied for or been granted employment authorisation, proof of nonimmigrant status and proof of your relationship with the principal beneficiary. For those using the H1-B Visa to stay in the USA whilst wanting a green card, note that over the last decade it's averaged about 6 years from getting an H1-B visa to getting a green card. Unfortunately there are some criminals who offer visas for purchase, where the purchasers typically are "working" for shell businesses. Avoid them. The H-2B Visa allows workers to come to the US on a temporary basis, working in the non-agricultural sectors, typically on low wages. L1 visas allow employees of companies with offices both internationally as well as in the US, to work in the US divisions. The visa could be for anything from 3 months to 5 years. Spouses of those with L1 visas may also work in the US with a L2 visa. Under the L-1A and L-1B visas, the visa applicant must have worked for the company for at least 12 months over the last 3 years. This typically allows one to work in the USA for up to a year, with 4 multiple entries into the country being allowed. If you can demonstrate "extraordinary ability" in your field you may be able to get an O-1 Visa, which is a nonimmigrant visa. The O-1A visa may be applied for if your ability is in athletics, business, education or the sciences. The O-1B Visa may be applied for if your ability lies in the arts, television or motion picture fields. If your children or spouse are accompanying you, they would apply for an O-3 Visa. If you have an assistant accompanying you, that person would apply for an O-2 visa. The O visa allows you to stay initially up to 3 years, thereafter USCIS will decide how much to extend the stay in maximum increments of a year. Foreigners who want to emigrate to the USA and start a business there run into problems, as the H1-B visa wasn't intended for this scenario. This is a program to allow Foreign entrepeneurs to remain in the USA if they have built a business which has the potential inter alia to produce sufficient jobs and grow quickly, which was meant to begin in July 2017 but was postponed to March 2018 by the new administration (Trump in charge), with it being suspected that the program will be abandoned completely. Under this visa you can enter the USA and work if you make a significant investment in the country. Unfortunately South Africa is not a Treaty Country, it does not have a treaty of friendship and navigtion with the US, South Africans cannot apply for this visa. On an annual basis US companies can collectively hire 5000 unskilled foreigners; which allows US companies which can't find US workers to hire unskilled immigrants. This is the fastest way to get a US green card, and involves investing $1 000 000 or more in US projects which qualify; but if investing in a rural area or an area with high unemployment then $500,000 or more is required. To qualify, the project must plan to create ten direct or indirect full time jobs for USA citizens, or at least to retain the jobs, In December 2017 it was voted to extend the EB-5 Visa program until the 19th January 2018. It's possible that on this date the minimum investment is increased from $500 000 to $920 000. An application is done through filing a form I-526 petition, and you will supply a mailing address as part of the the petition (make sure it's your address, not your lawyer's address - your lawyer can submit his/her address in a form G-28 Notice of Appearance, and will receive copies of relevant documents). After USCIS have received and accepted the I-526 petition, an I-797 Notice of Action should be received by yourself (and your lawyer) which provides you with a tracking number, through which you can track where in the process your I-526 petition is. When applying expect it to take around 12 months for USCIS to process the application. The applicant rejection rate is relatively high as a result of projects which don't qualify and problems with the documentation. If the application is approved then a temporary green card (called a "conditional permanent residence status") is issued for 24 months. Ninety days before 24 months have passed an I-829 petition may be submitted which involves demonstrating that the 10 jobs have been created/saved, and then the green card is made permanent. The I-829 petition must be submitted before the conditional (temporary) green card expires after 2 years. It's worthwhile reading the EB5 Investors quarterly magazines, which provide a wealth of contemporary information for investors and other industry professionals. Green card holders may bring their spouses and unmarried children younger than 21 with them to the US. Complete the I-130 form in order to petition for a visa; if this is approved you will then be requested to submit the required documentation including sponsorship commitments. The time spent with the conditional green card counts towards the 5 year permanent residency required to apply for US Citizenship. You're 18 years old or older. Been physically present in the USA for at least 30 months (minimum may be less if you're married to a US citizen). Have lived for at least 3 months in the USCIS district or state from which you are applying. Can read, write and speak English. You're willing to take the "Oath of Allegiance". Understand USA history and government. Note that being able to apply doesn't necessarily mean your application will be accepted - other factors like your criminal record, will also be taken into acount. Click here to create a profile and file your N-400 application online. Once it's submitted you will receive a receipt an tracking number, which you can use to keep track of where in the process your application is. You may be required to get biometricss (photo, fingerprints, etc...) taken. There's a fee chargeable to make the application (at the time of writing, January 2018, it was $725), but this fee may be waived if you have a short-term financial problem, are receiving public benefits on a means-tested basis or your household earnings is less than 150% of federal poverty guidelines. You will be required to write a citizenship/civics test, which involves being asked 10 questions chosen from a list of 100, and you must get at least 6 correct. At this stage USCIS will will either deny your application, grant your application, or request that you continue your application but provide correct information or rewrite citizenship test or something else. If your application is granted by USCIS, then take the oath pledging to be an outstanding American. If, when you turned 18, one or both of your parents was a US Citizen, then you may claim US citizenship via form N-600.